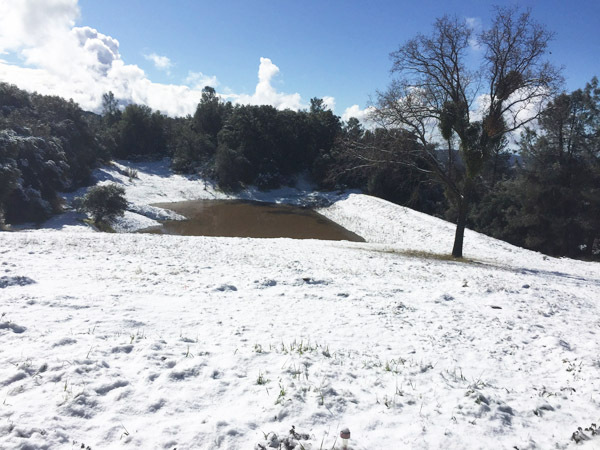 After one of California’s driest Februaries on record, it sure was great to get a drenching yesterday followed by overnight snow. First time the pond has had water in 9 months. Now you start to see how big it really is – over an acre I reckon. As to why it is there, I have no idea. And it leaks like a sieve as there are gopher and other burrowing critter holes every few feet. But spectacular scenery this a.m. I really love the snow especially when the sun shines too. Remember this is dry California country and snow doesn’t usually come down to this level (2800′). But amazing to watch on the radar map. You see this almost regular straight line of where the snow starts, and you realize it is exactly where the Sierra mountains reach a certain height – usually 4000′ – which happens to be the elevation of the valley floor in Yosemite. Snow brings us more visitors too, so another reason for me to love it. If you can find an empty date why don’t you come experience this great scenic time in Yosemite. We are close to the main West gate which is usually open most of the year and usually without snow chain controls – but I have a set for you to borrow just in case.